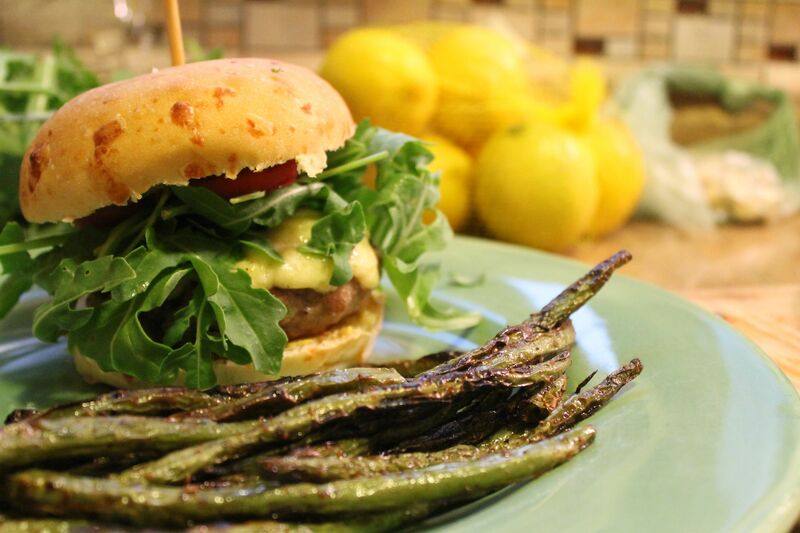 We are usually addicted to bison burgers on a Friday night—they’re just so good we can’t seem to deviate. Until that Friday when there was no bison to be had at the Whole Foods. PANIC! I called The Husband to see if he wanted a turkey burger, which he initially poo-pooed until he realized he had no choice. Then I spotted the ground pork—hey, I could mix the ground turkey with the pork to give it more flavor! No, said The Husband. I want an all-pork burger. And so he shall, I decided, but of course I need to make it spicy like my bison burgers. So off to the chili section for some serranos, and the store actually managed to have some jalapeño-cheddar burger buns. Result! Grab some arugula and we’re good to go. Now that I’ve found the amazing Da-Le Ranch, I ordered some ground pork to see how it would be. We defrosted it yesterday in anticipation of pork burgers, and indeed, they turned out so delicious. I don’t know why, but my burger reminded me of a monk in a cowl. Go figure. Since my eating habits have been forced to change, that jalapeño-cheddar bun was not going to work for me. Luckily, I follow so many other cooking blogs that when I saw the collard greens in the aisle yesterday, I knew I’d found my bun replacement. And I’m happy to report that I did not miss that bun at all! It was nice to just have the other flavors without the bulk of the bread. Don’t get me wrong, I love bread and always will, but the fact that I can’t have it and loved this replacement made me very happy! Now I can’t wait to figure out other ways to use my collard greens as a wrap. And, sadly, white potatoes are off my menu at the moment too, so when I saw the beans in the fridge last night, I knew exactly what to do. We were introduced to green bean “fries” up at Crow Bar in Corona del Mar when it first opened. The chef at the time, Brandon Scott, served them with his tuna burger as his take on a salad Nicoise. All I can say is that it is a genius idea, and I’ve stolen it for my own nefarious purposes. You do need a vegetable basket for the grill, or I suppose you could do them in the oven, but I’ve never tried. So, here’s our dinner last night, and I hope you enjoy the recipes! Vegans and vegetarians, please substitute the veggie burger of your choice in place of the pork burger. I’m formulating a recipe for one at the moment that follows my strange dietary requirements. Please watch this space! Mix all ingredients well in a bowl with your hands. Really make sure that the mayo is evenly distributed, as well as the chilis. Weigh out 5 oz. burgers and let chill in the fridge for about an hour (or more). Grill until the burgers are cooked to your preference, adding the cheese right before they are finished to melt a little. We usually serve our burgers with a slice of onion, perfectly grilled by The Husband, plus a slice of tomato, mustard, mayo and a heap of arugula on top. We prefer either the jalapeño-cheddar buns or brioche buns, but they aren’t easy to find. If you’re doing the collard-green wrap, carefully select a large leaf. Rinse it and dry it carefully with a paper towel so it doesn’t rip, then remove most of the thick stem through the center—but don’t cut the whole leaf in half. Make sure that the top third of the leaf is uncut. Use this as the bottom of your “bun” where you can spread your condiments and stack your grilled onions and tomato slice. 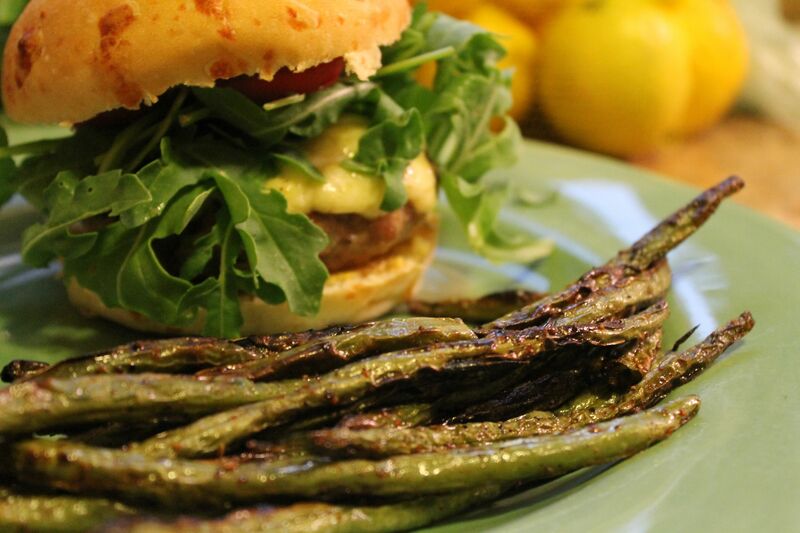 Then wait patiently for your burger to be ready, place on top and cover in arugula. 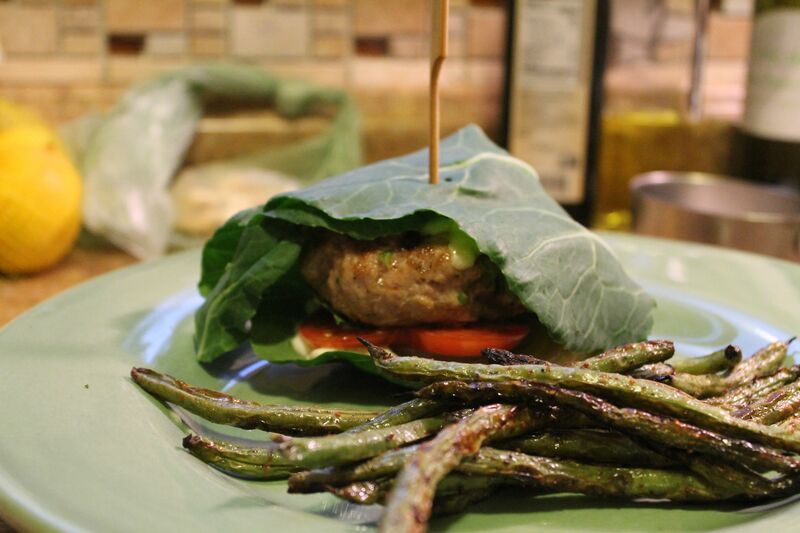 Wrap the bottom sections of the collard green leaf over the top of the burger and secure with a cocktail stick. Try not to eat it in three huge bites. It’s tough to resist, believe me! Mix the last four ingredients together in a small bowl. Trim the picked end off the green beans, but you can leave the little pointy end as it is. Rinse and dry them in a towel, then mix in a bowl with the other ingredients, tossing well so that the green beans are well coated with the spices. 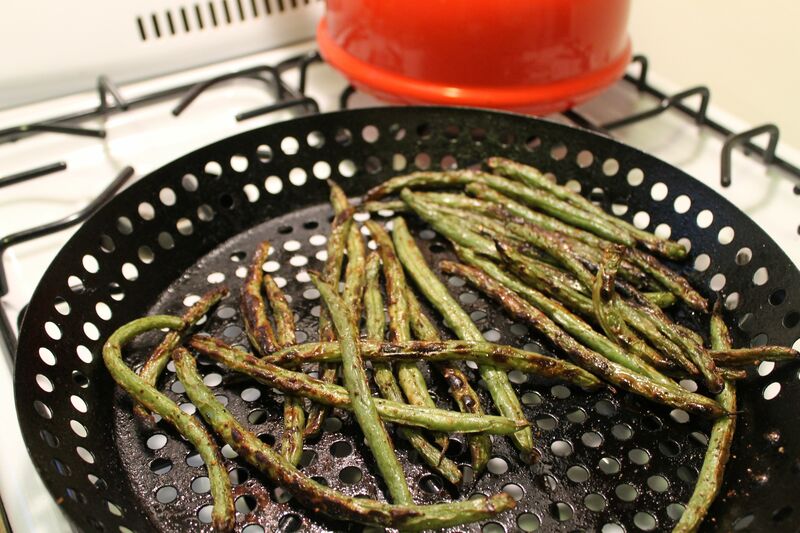 Using a vegetable grill pan or basket, cook the beans on the grill, watching carefully and cooking until they are still a little al dente, but have that nice char on them. Serve immediately! But try not to burn your fingers. The “traditional” pork burger with “fries”. This grill pan was all of $5 at Bed Bath and Beyond, and has lasted for years. 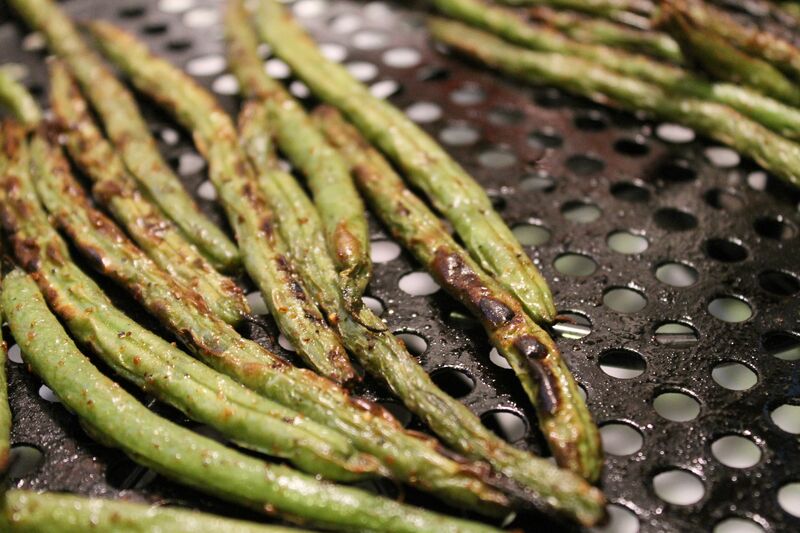 Forget the pork – – what about the green bean fries?! Oh my goodness. Is it fate/kismet/providence or just plain coincidence that I have a bag of freshly-picked green beans in the refrigerator?! It’s divine (food) intervention!! Go get ’em!!! Agreed! Those bean-fries look amazing. I see a lot of those in my near future! I want that freaking pan now! Right back atcha, awesome lady! Oh, I just realized my oven is a flat glass cooktop. BOOO! Oh man, I need that anyway for camping…..! It would be indispensable camping! For some reason I’m not a fan of green beans, probably some childhood eating trauma…….but I think I would be willing to give these a try! What a wonderful menu! I like burgers but have never made them at home. I’ve seen the ‘bunless’ trend on tv and wondered how it would taste, but your pictures show it’s delicious! And these beans I have to try. We eat them pretty often and this would be a great variation! Mos definitely must try those green bean fries! Busy harvesting lots at the moment… and we have our own ‘secret’ pork burger recipe to go with them! I just bought a ginormous thing of smoked paprika at Costco and I am obsessed with it. SUPER excited to put it on some bean fries!! I’m going to have to try the green bean fries. I usually go for courgette fries as an alternative but these look amazing!